Cut chicken into short strips. Saute in hot pan using oil or chicken broth so it won't stick. 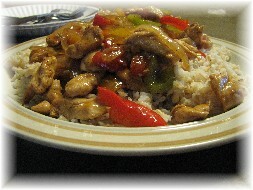 As chicken becomes white, add vegetables and saute until veggies are tender. Add seasoning packet and 1/2- to 1 cup of water. Cook until the liquid in the bottom of the pan becomes thickened, like gravy. Add additional water if desired. 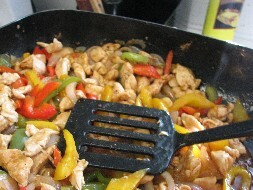 If you have leftovers you can warm it up for fajitas the next day by wrapping in flour tortillas.